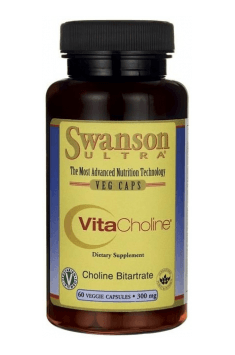 Swanson VitaCholine® is a dietary supplement composed of choline in a perfectly absorbable form of choline bitartrate. High, pharmaceutical quality of the raw material is compliant with global standards and has been confirmed with the registered trademark VitaCholine®. The preparation has a very wide range of positive properties. It nourishes the brain and promotes its functions from the moment of conception until grand old age. It has health benefits for the liver and cardiovascular system and it has a favourable impact on physical performance. Choline is an organic chemical compound that is often compared to B group vitamins because of its biological functions. The human body is capable to synthesize it. However, for its proper functioning, much more choline is needed than the body is able to produce. Animal products as egg yolk, meat and offal are its good external sources. It can be also found in vegetable products - soy, peanuts, oatmeal, rice and beans. The systemic activity of choline is very wide. It is a part of phospholipids and it participates in the synthesis of neurotransmitters and cell signaling. It is also involved in the transport of lipids and metabolism of methyl groups. During pregnancy and lactation period, the demand for choline increases dramatically. Its deficiency rises not only the risk of neural tube defects in the fetus but also mother's perinatal complications. In turn, maintenance of recommended level of choline brings benefits at a later stage of the child's life. It is estimated that if during pregnancy, mothers are on a diet rich in choline, their children will be smarter, more clever, have better memory and learn faster. Large amounts of choline are transferred to the fetus through the placenta. The mechanism of its operation includes DNA methylation, regulation of gene expression and impact on stem cell proliferation and differentiation. Interestingly, choline can also affect cortisol-controlling genes. Thanks to this, probably, the children who received the right amount of choline in the prenatal period, cope better with stress at later sta ges of their life. Choline is crucial for cognitive health and memory not only at the prenatal development stage but also in early infanthood. Also, at a later age, its increase in supply may result in the improvement of memory and cognitive functions. This compound acts as a precursor of acetylcholine which is one of the most important neurotransmitters and thanks to which, it is possible to acquire and recall memorized information. The choline is also composed of phospholipids that build cell membranes. The integrity of the communication system between cells in the brain and particular systems in the body, depends mosty on the condition and efficiency of cell membranes. Choline deficiency may increase the risk of cardiovascular disease. In the body, it performs the function of a donor of methyl groups, and thus it increases the efficiency of methylation. This process is crucial for the utilization of homocysteine, whose elevated level correlates with chronic diseases, especially those associated with the cardiovascular system. In one study, it was shown that the increase in choline supply in a group of men with elevated plasma homocysteine levels was enough to lower homocysteine to a safe level. Choline supplementation to reduce homocysteine levels was as effective as folic acid supplementation. Choline may be an important factor regulating the intensity of inflammation in the body. Clinical trials show that people with high levels of choline usually have a lower level of markers of inflammation in the body (including CRP, IL-6, TNF-α). It is good to know that chronic inflammation is associated with accelerated aging of the body and a higher incidence of lifestyle diseases. The anti-inflammatory properties of choline can be a suitable strategy in the fight for health and well-being. The diet of physically active people should contain sufficiently large amounts of choline. This substance can have a positive effect on the body's efficiency and contribute to the improvement of sports results. Researchers have found that the diet rich in choline has a positive impact on the reaction time and improves motor coordination, which is important especially for team sportsmen. In addition, choline improves focus attention and long-term concentration. As far as the role of choline in sports supplementation is considered, it is necessary to mention that acetylcholine is synthesized from choline. It is responsible for stimulation of skeletal muscles and smooth muscle spasms. In addition, it improves the expansion of blood vessels, thanks to which, more oxygen and nutrients reach the working muscles. To sum up, Swanson VitaCholine® is an ideal possibility to enrich the diet with high quality choline. Its supplementation is recommended especially to pregnant women and people at risk of cardiovascular diseases. In the case of memory and cognitive functions impairment, you can also expect improvements. It will be a great choice for physically active people. Take 1 capsule one to two times per day with food and water. The upper limit of choline consumption is about 3.5 g per day for an adult. However, you should remember that this compound is commonly found in foods, therefore supplementation of such amounts is not recommended. The final dose should be adjusted to your own needs and goals of supplementation. In prevention, doses of 250-500 mg are most commonly used. If the goal of supplementation is to strengthen memory, you should take of 1-2 g.
Hypromellose (vegetable capsule), silica, magnesium stearate.